Most of you are problably aware of Microsoft (Windows) Intune extensions and using them briefly without any issue(s). New extensions becomes automatically available through the Microsoft Intune connector and new updates are merged or installed to introduce new features taking benefits of the Microsoft Intune cloud services platform. So far so good…but if you’ve bad luck extensions comes partly down or becomes not available at all to your Configuration Manager instance! Unfortunately there is no way to force a trigger of the tenant discovery process and thus the installation of Microsoft Intune extensions. In normal circumstances it will take up to 24 hours after registering your Intune subscription untill the Intune extensions comes down to your Configuration Manager instance. This pitty if you would speed up the process of installing new deployments or you’re in a disaster recovery scenario. 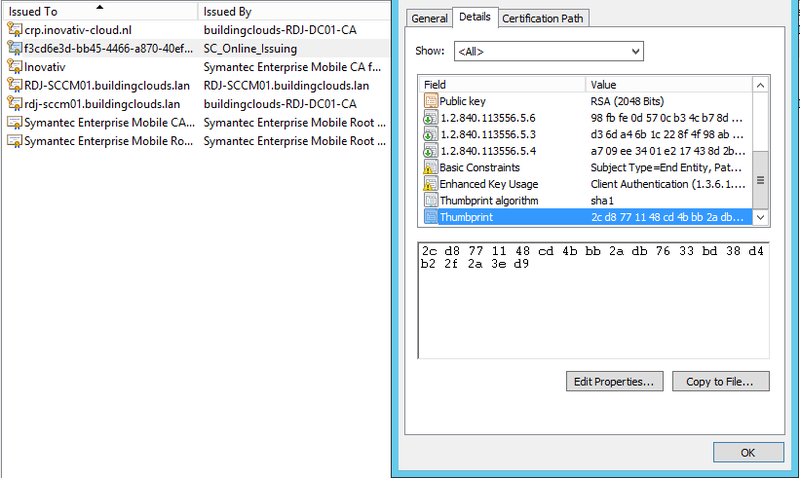 Hereby some guidelines for troubleshooting Microsoft Intune extensions, logs locations(s), Certificate Thumbprint ID, SQL query and validating the connectivity with Microsoft Intune. 1. Download PSTools, see http://technet.microsoft.com/en-us/sysinternals/bb897553.aspx 2. Open an elevated admin CMD window 3. Change directory to the folder that contains PSexec (unless psexec is in a folder in your PATH already). Type the following line. (-i is for interactive, -s is to run as system) psexec -i -s cmd.exe hit ENTER 4. Another CMD opens after hitting “Enter” above. Verify you are now running as the system by typing whoami. The reply should be “nt authority\system” 5. Launch IExplore.exe and go to manage.microsoft.com. If the connection fails, the system account has been blocked. Hereby you can rule out Proxy/Firewall issue(s) here. The following table lists the log files that contain information related to Extensions and applies to Configuration Manager 2012 R2. Make sure your Certificate or thumbprint ID for both the registry key HKEY_LOCAL_MACHINE\SOFTWARE\Microsoft\SMS\SMS_DMP_CONNECTOR and Machine certificate assigned under the Machine\My Certificate store match. If they do not match re-install the Windows Intune Connector site system role. Don’t forget to change the LocaleID to the appropriate ID corresponding you local/region. You can skip this entry to list all extensions by all locales. See also my previous blog A closer look at Windows Intune Extensions…what’s in it for me? how the mechanism of Microsoft Intune extensions aka Windows Intune extension works. Big thank to the Windows Intune Technical Support Team providing some insights troubleshooting Microsoft Intune extensions. I just found your blog and have been interested in learning more about Intune, so this is great stuff! My only comment would be that the font color on your blog is a bit hard to read on a PC/tablet screen with the current theme set. Otherwise, the content and writing is fantastic. Thank you! What is the mechanism / logic for when SCCM checks for extensions, and where do those extension definitions come from? I running 2012 R2 SP1 and yet I am missing the iOS9 extensions and can’t find a reason why. Hi Brian, Microsoft Intune connector site system role is responsible for downloading available extensions into your hierarchy. You must have a Microsoft Intune subscription in order to get these extensions available in your console. From Configuration Manager 1511 the Service Connection Point is responsible for get these extensions and new Configuration Manager updates in general available, without requiring a Microsoft Intune subscription.